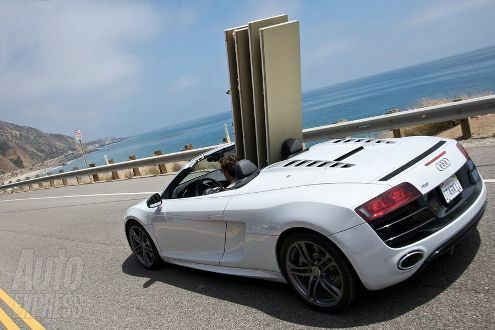 Those awesome guys over at Autoexpress have managed to get a few snaps of a pre-production Audi R8 V10 Spider during filming for the upcoming Iron Man II movie. The roadster, whcih is due to take on the likes of Porsche will have the same power as the coupe, pushing out 525hp and 530Nm of torque through its 5.2-litre V10 beast. 62mph should come in a touch over 4 seconds and she won’t stop until she hits 180mph. Expect the official announcement at the Frankfurt Motor Show with sales in late 2010 for a snip at £105,000.